Recently my Mother In Law asked me to make her a hat. Now it isn’t unusual for her to ask me to make her something. I think at least 25% of everything I make is either for her and my Father In Law or it is something she orders to give as a gift to a friend. The reason it is unusual is she asked for a hat. Normally she only wears those little sun visors that go around your forehead and won’t mess up her hair. So I handed her my phone with the Craftsy pattern app pulled up and set her loose. She picked the Crochet Puff Beret by The Good Shnit. The pattern is for a loose boho type beret. I love it. I made it out of Lion Brand Kitchen Cotton yarn in Grape. It took a skein and half to make and only 4 hours. I think anyone who has a few crochet items under their belt will be able to pull this off. The hardest part of the hat is keeping your puff stitches even. If you have never tried it before it is a pretty easy stitch to do. The key is to keep your stitches the same height and to keep them tight. If you make them different heights your rows are going to be uneven. If you don’t keep them tight then you are going to have loose yarn sticking out in funny places. To practice make a guage swatch 22 sc wide where you can practice before you make your hat. Make sure when you work puff stitches to have the total number of loops for that stitch. For this hat the puff stitch has 9 loops you have to pull through, and the half puff stitch only has 5. Depending on the designer your puff stitch can have anywhere from 3 to 12 loops you have to make. I made a gauge swatch and found that for the center circle of sc I needed to use a G hook to make it 2.5 inches. I did the whole hat and tried it on. It was child size. I had to frog the whole thing and make it with an I hook. Then it fit perfectly and was big and loose. So when she says in the pattern that you don’t have to worry about the gauge – take her seriously and go bigger than you think you need to. Remember if the band ends up to loose you can always sew a piece of elastic thread into it to make it fit your forehead perfectly. On Row 13 when I was told to work DC2TOG in the tops of row 12 I was a bit tired and couldn’t get it right. I just did a DC2TOG on each side of the stitches from the row below. You still end up with the right number of stitches in row 13 and you don’t have to try and stitch into the chain spaces. A easy pattern that I will make again. 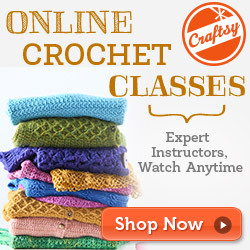 I recommend whole heartedly for any level crocheter.